GitHub is great for hosting and managing codebases, but let’s be honest: it’s not very pretty. A new tool named DevSpace is helping to change that, and actually makes GitHub more contextual. What DevSpace is good at is making GitHub more social. 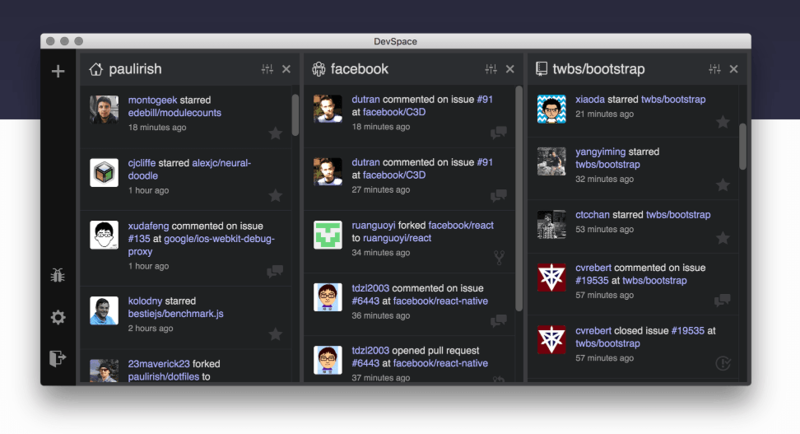 It’s just like Tweetdeck, where various repos are columns, and refresh in real-time based on comments and pull requests. You can even track multiple feeds, so those various projects your contributing to no longer require you to jump from page to page in a browser. For those huge projects with a lot of contributors, DevSpace allows you to block things out. If you don’t care to see every time someone stars a repo, just eliminate that event from your feed. According to DevSpace, its tool is already in use at Google, Tesla, AirBNB and Twitter (irony!). Even if you’re not as active as you may like on GitHub, DevSpace is still a cool way to keep track of projects.